Based in San Diego, California, Management Systems International (MSI) offers affordable onsite and online consulting services to augment your staff, help with ISO/AS certification or strategize on significant organizational changes that could affect your current certification. Without disrupting your operations, we can help you minimize the cost of monitoring, measuring and continuously improving your environmental and/or quality management system. 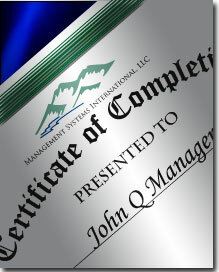 Perhaps you began the ISO/AS certification process on your own and became overwhelmed. Or maybe some of your key people have left the company. Are internal audits consuming critical resources and disrupting your company operations? Are the results of internal audits effective? Need to qualify suppliers or perform supplier audits? Are you worried about passing your surveillance or interim registration audits? Maybe it’s all getting out of hand. There’s no need to let the certificate expire. MSI offers affordable onsite services and online resources that can quickly address these concerns. And you can once again enjoy peace of mind, knowing that the experts are in partnership with you towards greater success. Here are some areas where our proven SureResults onsite consulting services can assist you. More information is available by clicking on the associated link. ISO 9001, ISO 13485, 14001 and AS 9100 Internal Audits Minimize your overhead by considering our highly trained and experienced consultants as your internal auditing team. You will receive comprehensive and effective results without compromising your resources and schedules. ISO/AS Documentation Development Preparing the required manual and procedures is typically the most difficult hurdle for organizations seeking ISO/AS registration. Using our documentation tools and templates MSI can develop all or a portion of your documentation while saving you time and money. ISO/AS Documentation Review Use MSI to review your documents and provide guidance to streamline your procedures and manual. Our experts will also provide suggestions to ensure your documentation complies with the ISO/AS standard. ISO/AS Implementation Consulting If you need guidance and support but don’t require a complete solution, our consulting services are right for you. Lean on us as required during the implementation of your management system and the registration audits. Management Placement Services for Quality Systems Personnel You want to hire Quality or Environmental System personnel but need help developing the job spec and required qualifications, and locating and interviewing candidates. Engage MSI to perform the legwork necessary to provide you with a short list of qualified candidates. Other ISO/AS Consulting Services Consider MSI as an extension of your staff to minimize your cost of monitoring, measuring and continuously improving your management system. MSI can perform supplier audits, employee training, process improvement, management review reporting, and many other services on your behalf.